During the height of summer, nothing beats relaxing on a shady patio with an ice cold drink to quench your thirst. But what if you don’t have the luxury of a shady spot outdoors? A retractable awning is a great non-intrusive way to take back your patio from the oppressive summer heat and transform it into a shady paradise. With so many different sizes, colors and option to choose from there are a lot of factors to consider. In this article we’ll review a selection of the best retractable awnings, going over their features, dimensions and more so you can enjoy every last inch of your outdoor space. If you don’t care to read the full reviews and comparisons, you can click here to go straight to our top pick. We’ve compiled the table below with our top three choices for easy reference. With five colors and sizes to choose from along with the option to upgrade to an electrically operated motor the easy to use ADVANING Classic C Series is our top pick for the best retractable awning. Built with robust Corrosion-resistant 6063-T5 Grade aluminum and weighing in at 53 pounds it is the most durable option on our list. The 100% acrylic fabric canopy provides the ultimate in shade with UV80+ sun protection and excellent fade and mildew resistance. Plus the dual stainless steel cables provide excellent strength so you don’t have to worry about them snapping when you’re operating the hand crank. We had no second thoughts when we went to buy some cool mini lantern lights for the awning as we were sure it could take the weight and they looked great. After installation the easy pitch system made it extremely quick to level the awning out and it was great not having to climb ladders and fiddle with small bolts and nuts 9 feet of the ground. Plus extending this patio awning was a breeze and the stable design meant we didn’t have to baby the crank. The all-in-one aluminum semi-cassette hood provide excellent protection for the fabric canopy when retracted as it fully protects it from the elements so it’s ready to use as soon as you are. Overall this manual retractable awning is far superior the the other options and is almost in a class of it’s own, the sheer versatility and durability make it a great choice and our number one pick for the best retractable awning. We’d suggest you read a few more reviews and take a look at some additional photos of the Classic C Series so you can truly get a feel for just how well built this awning is. 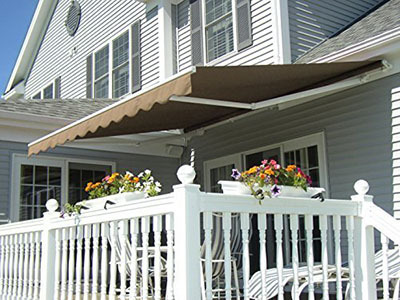 This professional designed retractable awning is perfect for patios both large and small. With a variety of sizes and colors available it’s easy to find the right fit for your home. Made from durable 6063-T5 aluminium alloy and retracted with twin 316 grade stainless steel cable you can expect incredible corrosion, water and rust resistance. 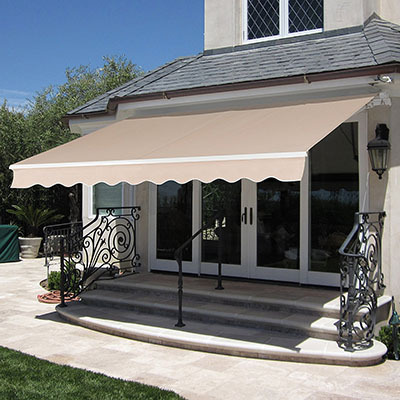 The high quality components don’t end with the frame either, the awning shade is made from 100% 280G polyester fabric that has been PU coated to provide UV80+ sun protection as well as enhanced fading and mildew resistance for an extended lifespan. We loved the fact that the canopy top was totally water and sun resistant yet still breathable to promote airflow and reduce trapped heat and moisture. Upon delivery this patio awning is delivered in a large box and is ready to be put up with almost no assembly, simply hand the included bracket and lift the retractable awning into place. The included chrome plated screws provide superior corrosion resistance and strength when compared to traditional hardware. After installation it was easy to adjust the pitch of our new canopy from anywhere between 0 and 45 degrees. This is a great patio retractable awning and with the variety of sizes and color you’ll certainly find something that fits your style. We decided to add some globe string lights for that perfect outdoor ambiance. If you’re still unsure head over and read some more reviews of the Diensweek before making your outdoor shady paradise a dream come true. This beautiful retractable awning comes in your choice of either a neutral beige or striped blue and white coloring to match your existing exterior. With a stunning white powder coated aluminium frame, your new awning will be both rust and weather resistant right out of the box. The canopy fabric is made from a UV and water resistant polyester material that can stand up to the beating sun of the south and the bitter cold winters of the north. Plus with 53.3 square feet of shade you’ll reclaim a large portion of your outdoor living space. 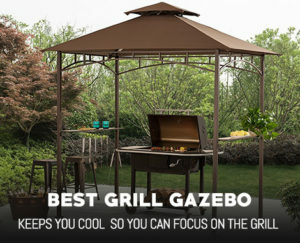 The manual crank makes this a great budget option that require almost no maintenance and a very quick awning deployment. The ALEKO Retractable Patio Awning is another great choice when it comes to retractable awnings. With 80 square feet of shady and a well engineered design, this is a sturdy, yet stylish patio shade that is built to last. We were impressed the smooth hand crank and just how easy it was to roll out the canopy. In under a minute we can fully extend or retract it with little to no effort. Plus without a motor the left side mounted hand crank is extremely quiet and won’t wake the neighbors in the early hours of the morning. The canopy itself is woven from a thick and durable material that completely blocks the sun’s rays and is near impervious to tearing. The fully tensioned fabric provides superior strength and rain resistance as well for even more added quality. The ALEKO awning ships fully assembled and ready to go, simply install the two included mounting brackets on a solid backing, hang it up and your shady retreat will be complete. Once installed we were impressed with just how stable the unit felt. There was no wobbling or creaking as we attempted to nudge it and put it through its paces. Another great feature of this retractable patio awning is the pre-drilled accessory attachment holes. These make is super easy to install the optional electric motor or vertical support arms which provide you with a few more options to customize the awning to your liking. 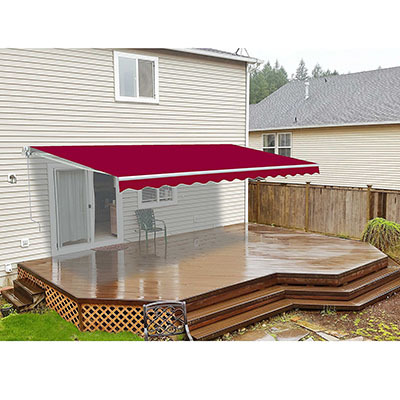 Overall this is one of the best retractable awnings on the market due to it’s reliability, ease of use and upgrade potential, plus the burgundy color looks great when fully installed. Click here to read more reviews and see if this is the right awning for you. Last on our list and probably our least favorite of the bunch is the XtremepowerUS Manual Retractable Sun Shade Awning. This elegant looking patio shade cover come with a refined light brown canvas top and has a flow wave pattern which does a great job of adding some style to any back patio. With an aluminium and plastic construction it was a bit wobbly when we put it up and we felt that the plastic mounting hardware could have snapped in a strong breeze. We much prefer a backyard awning to come with metal hardware. The manual crank did an excellent job of extending and retracting the canopy quickly but we were disappointed that there was no cover for the awning once retracted. We’ve found this is a great feature that really extend the life of the cover. Assembly wise the unit went up very quickly but some other have noted that the unit didn’t ship with the required mounting hardware, so you might want to pick up a spare set if you plan on getting this unit. We also noticed some sag when the awning was fully extended but it didn’t seem to be too much of an issue. If you’re worried about it, grab a set of adjustable support legs for added insurance. In the end though, this is a serviceable awning that does the job of blocking out sunlight and creating a shady spot in your backyard. While we’d still recommend the other options first, if you have your heart set on this one read some more reviews to be sure it’s right for you. So Which is the Best Retractable Awning? 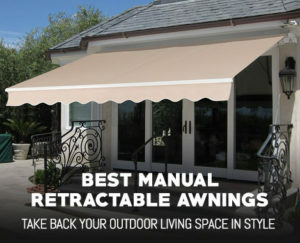 Based on our research, testing and gut feelings the ADVANING Manual Classic C Series is one of the best retractable awnings on the market, you can pick it up for the lowest price here. We love it’s durable design, wide size and color ranges as well as the fact that it is also offered in a motor operated configuration. With a host of extra supports, high quality material and superior, easy to use adjustment points it is by far our top pick. 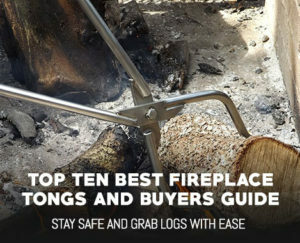 If you want to take your patio even further you can check out our fire pit buyers guide so you can have shade by day and fire by night for that perfect outdoor experience.